We put beauty in the best hands: Yours! Age smarter: with the highly active SMART AGEING CURE, the first professional 14-day skin treatment you can do at home. A cosmetic home solution that, for the first time, allows you to continue the high level of institute treatments in order to effectively combat lines and wrinkles like never before. Before you start the 14-day programme to effectively counteract the signs of skin ageing, your skin will be pampered and perfectly prepared for the home-use treatment during a professional treatment performed by your beautician. For years, medicine has been successfully leading the way. Now, you can effectively and comfortably recreate this treatment at home. Continuous use of ultrasound to counteract wrinkles. 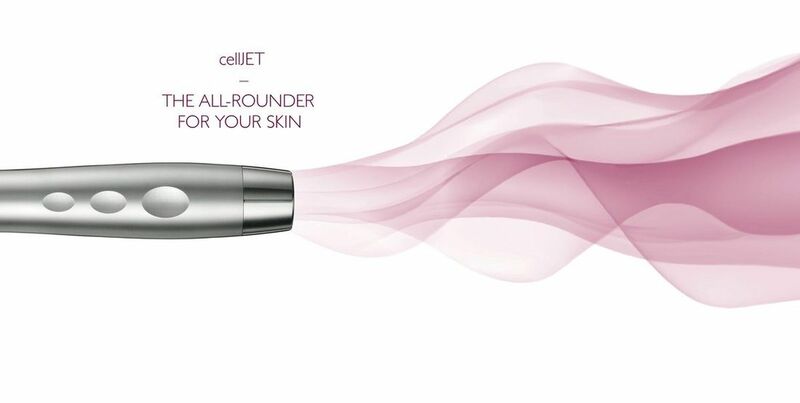 cellJET: a professional ultrasound handpiece developed especially as a home treatment. The combination of cellJET and high-potential vitamin C results in the perfect synergy for counteracting the ageing process early on and preventing it on a long-term basis. Both are already uniquely effective in their own right. In combination with one another, and when used continuously, they form an unbeatable team in sustainably building up collagen. The cellJET is used to regulate skin processes and to encourage the synthesis of collagen and elastin. It is the perfect preparation for the use of high-potential vitamin C spheres. It relaxes the tissue, allowing the vitamin C serum to penetrate deeply, spreading into and enriching all layers of the skin without losing effectiveness. ​A professional, instrument-based application for use in your own home complemented by a treatment from your beautician. The revolutionary concept from cellJET makes this possible for the first time. The most comfortable and efficient way to achieve long-lasting firm and visibly younger-looking skin. cellJET is a professional ultrasound handpiece equipped with revolutionary 10 MHz technology. Including several groundbreaking benefits.